On first hearing Lou Harrison’s violin concerto, Madeleine Mitchell was entranced by the colourful array of percussion and its juxaposition with the violin’s innate lyricism. Indeed, this description could fit almost all the works featured on this lively, multi-rhythmic disc. Both string and percussion blend in a unique mix of styles from early Andalucian music to a Stravinsky inspired piece, Fragments from a Gradual Process. Complex rhythms from the Ensemble Bash who use rhythms of West African drumming as the core of their playing, combined with Madeleine’s interweaving lines often catch the listener in a moment of surprise. This work, which is inscribed 1959-1940 is also entitled Koncerto por la violono kun percuta orkestra (in Esperanto, of which Harrison was a fervent advocate and expressing the world-view inherent in the work). This odd method of dating is probably meant to suggest that the work, reflecting his interest in world music and percussion, was conceived early on, but was completed later, after Harrison had turned away from twelve-tone serialism and revived those earlier concerns. It was first performed in New York’s Town Hall in 1959 by the violinist Anahid Ajemian, to whom it is dedicated. There are five percussionists and an interesting and very original variety of percussion instruments. Sometimes this percussion work is rhythmic and incisive, but often it is delicately and coloristically scored, in the manner of a gamelan. Against this textured wall of sound, the violin stands out in high relief as intensely melodic—although it is often rhythmic and colouristic as well, with the highly original sound of the double bass laid on its back with the strings hit on both sides of the bridge, creating fascinating ostinati especially in the first Allegro. “East meets West” is very much the theme of this musical discourse. Instrumentation: violin, 12 brakedrums, 6 flowerpots, plumbers pipe, damped plumbers pipe, wind chimes (glass & metal), 2 sistra, temple blocks, dustbins, spring coils, cymbals, congas, gongs, double bass laid on its back and struck with sticks, snare drum, tom toms, maracas, 2 triangles, tin cans. This performance features Karen Hutt on percussion. This piece is based on the idea of finding common ground between the lyricism of the violin and the colour and attack of the percussion. I used the term Rhapsody as homage to Rhapsody in Blue. Vermilion, however is an extravagant, expensive orange-red—a bright, vibrant colour for the Red Violin to explore. Broadly speaking the piece starts with a fast exposition alternating sections of percussion dominance and lyrical violin lines. A slow middle section follows which the violin bookends with pizzicato notes and the percussionists take up the bows on cymbals and crotales. The violin heads off in a dance like final section followed by a brief coda recalling the opening material. Vermilion Rhapsody was commissioned by Madeleine Mitchell and ensemblebash in 2007 with funding from Arts Council England. First performance—The Red Violin festival, Cardiff 2.10.07. Instrumentation: violin, marimba, vibraphone, finger cymbals, cymbals, mark tree, triangle, woodblock, 2 tam tam, glock, sizzle cymbal, bass drum, crotale, bongos, temple blocks, pin chimes, 2 tambourines, pin chimes, cabasa. When I was asked to compose a piece as a concert-partner for Lou Harrison’s Concerto for Violin and Percussion Orchestra I was keen to write the antithesis of a concerto, involving all the players equally, performing as one unit. Two very different examples of this attitude came to mind: the brief moment at the end of Stravinsky’s Soldier’s Tale (1918), where the violin blends into the percussion before vanishing and Steve Reich’s early 1970s loop-based compositions, Clapping Music and Six Pianos, written after his trip to Ghana, where he studied drumming. It seemed logical to allow the influence of Reich’s modernday hocketing and Ghanaian-infused rhythmic ambiguities to permeate the periphery of my own piece as I knew that the musical culture of Ghana is at the heart of ensemblebash. In addition, I decided to give a ‘nod’ to Stravinsky in the very opening violin chord, forming the basis of the first section which gradually shrinks with each of its three re-occurrences. While the background pulse remains constant, the use of accenting and modulated time signatures creates a permanently shifting beat which is itself affixed to a broad sectional arrangement not dissimilar to a classical rondo. Fragments also marked my first experimentation with the music of North Africa, specifically Algerian Raï. Ideas hinted at here, went on to evolve greatly in subsequent compositions, Raï and Sevens. It was interesting for me to watch how Fragments grew out of such geographically and musically disparate stimuli. But, as Steve Reich wrote in his 1968 seminal essay, Music as a Gradual Process, ‘all music turns out to be ethnic music’. Commissioned by ensemblebash and Madeleine Mitchell for their first concert 21.4.05 Turner Sims Concert Hall, Southampton. Instrumentation: violin, marimba, vibraphone, glockenspiel, tam-tam, 2 gyile, 3 gongs, 2 triangles, cymbal, high hat, tambourine, 3 cowbells, woodblock, bongos, maracas, 4 tom-toms, snare drum, bass drum. Gharnati takes as its inspiration and starting point the music of the Moorish Civilisation that flourished in Andalucia (Al-Andaluz) up to the late fifteenth century. This culture was at the time the most sophisticated in Europe, and its music had a profound influence on the music of the troubadours and the European Courts of the time, and hence on the development of Western art music. It survives to this day in the Andalusian Music of the Maghreb. The piece is developed as a set of variations which create a suite of dances, somewhat in the Western tradition, but adheres strictly to the unstable Andalusian mode Zaydan, which is based on D with a ‘tonic’ of G, and which has alternating forms with major or minor third and sixth, and flattened or sharpened seventh. Its rhythmic schema is derived from that of the Tarab Gharnati (Granada), one of the great surviving compositions of the Andalusian culture. It may help to remind us of the huge debt we owe to Islamic civilisation. 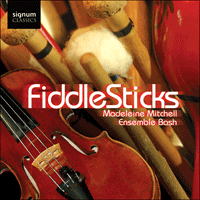 The violin part uses scordatura—tuning the ‘E string’ down to a D.
Gharnati was commissioned by Madeleine Mitchell and ensemblebash in 2007 with funding from Arts Council England. First performance—The Red Violin festival, Cardiff 2.10.07. Instrumentation: violin, tamburello, darabuka, rattles, cabasa, vibraphone, 2 x marimba, saw, crotales, bows. Simon Limbrick is a percussionist/composer friend of ensemblebash and Madeleine Mitchell. Mopti Street is an improvisation based on Kora themes that Simon collected from traditional Malian music. Instrumentation: violin, vibraphone, steel pan, gyil, marimba. Kumpo was taught to ensemblebash by Paulinhus Bozie, a ghanaian master drummer and gyil player currently living in the UK. It’s a senegalese male circumcision dance where it’s said “the great spirit Kumpo protects boys during their rite of passage”. Following this ceremonial transition, Kumpo is danced in celebration for days by all the men and women in the village. Reflecting ensemblebash’s passion for African rhythms, its original five-section structure forms the basis for ensemblebash’s concert adaptation. Instrumentation: 3 x djembe, dun dun. The group was awarded a major grant from Arts Council England for nationwide touring which has included Symphony Hall Birmingham International Series, London’s Chelsea Festival, appearances on BBC Radio 3 and Classic FM, and many other venues.